Brussels sprouts (Brassica oleracea) are cruciferous vegetables originally cultivated in Belgium in the 16th century. These small, cabbage-like buds belong to the same family of vegetables as broccoli and kale, both of which are vegetables known for their multitude of health benefits. Brussels sprouts are no different. A single serving has very few calories yet contains enough vitamin C and vitamin K to meet the recommended daily allowance. Specifically, one cup of Brussels sprouts will provide up to 125 percent of vitamin C and 195 percent of vitamin K needed for a day. The smaller the Brussels sprouts, the more tender, sweeter and less fibrous they are, making these the ideal ones to use in cooking. Roasting Brussels sprouts is the best way to preserve their green color and nutritional content, while also concentrating the nutty sweetness of the vegetables. Steaming Brussels sprouts is another viable option, as this method also helps retain the majority of their beneficial nutrients. A simple and easy way to eat Brussels sprouts is to fill them with bread crumbs, Parmesan cheese and minced garlic and then roast them in the oven. Note that overcooking Brussels sprouts will strip them of their nutritional value and bring out the bitter flavor and sulfuric smell commonly associated with this vegetable. 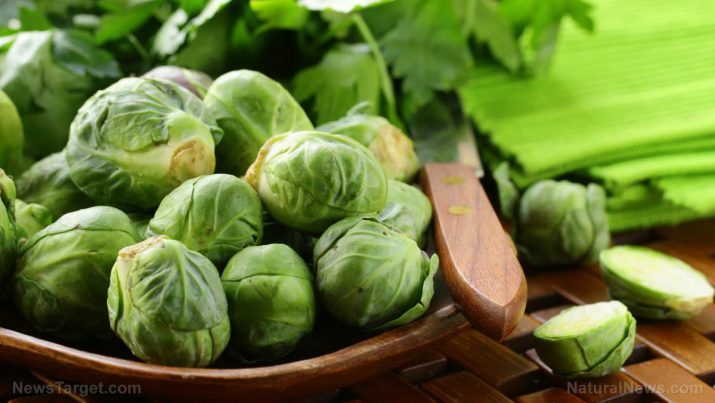 As a provider of vitamin K, Brussels sprouts are key in ensuring bone health and mitigating the risk of bone fractures. This vitamin not only modifies bone matrix proteins, but it also reduces the amount of calcium excreted during urination and facilitates better calcium absorption. Moreover, Brussels sprouts contain a fair amount of calcium, making them one of the best vegetables for greater bone health overall. Apart from glucosinolates, Brussels sprouts also contain isothiocyanates, another antioxidant that’s said to prevent cancer. Brussels sprouts are generally healthy vegetables, however, they are not recommended for individuals with thyroid dysfunction because of the goitrogens, which may trigger swelling of the thyroid gland.